The Fast Fuse 5-Day Sale is BACK! The wait is over! 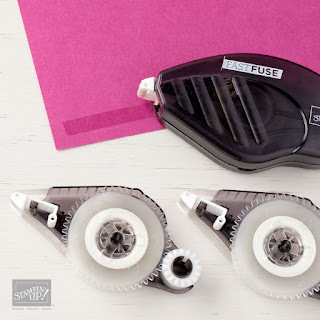 As we promised, we're bringing back the Fast Fuse Adhesive deal! For five days only, when you buy ONE Fast Fuse Adhesive, you'll get TWO Fast Fuse Adhesive Refills for FREE - while supplies last! This is the perfect time to stock up. This promotion is intended for 5 days but it is available while supplies last! This deal will be gone before you know it!!! Here is an excellent video from Stamping' Up! I highly recommend that you watch it to learn how to use the Fast Fuse. Enjoy!